These bars are good, baby. Good in a sweet and rich and crisp and immensely decadent kind of way. The best part? You only need about 15 minutes hands on time to make these bars a part of your life. The ingredients are simple and lovely. 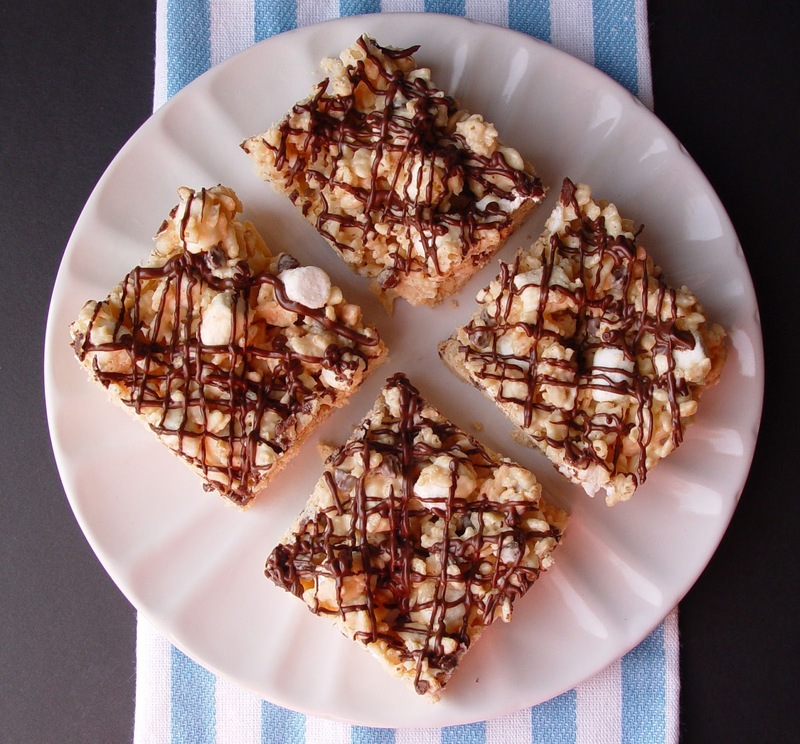 There is no baking required and I’m pretty sure everyone you know is going to love them. Make them today, make them this weekend, make them with a smile on your face and a skip in your step. Then pass them around to all of your neighbors and friends and loved ones and those you can barely tolerate. Then hit the pavement and run yourself a good mile or two, or bench press your 5 year old or something…sound good? Let’s make them then, without further ramblings, for goodness sake. 1. Toss one whole bag of white chocolate chips into a microwave safe bowl. Melt the chips in the microwave in 30 second increments, stirring after each heating period. Don’t let the chocolate get too hot, or come into contact with any water. This will make it seize up and turn into a brick. I’m not joking here. This is not something to be happy about. Just heat it for 30 seconds at a time, okay? All will be well. 2. Add 1/4 C peanut butter to the melted white chocolate and stir it nicely so that the two become one. and pour the white chocolate/peanut butter mixture over the top. Stir it together with a wooden spoon, or rubber spatula. and 1/4 cup of the mini chocolate chips. Please note that you are going to be saving the other 1/4 cup of mini chocolate chips to melt and drizzle over the top. 5. Spray a 9×9 inch pan with cooking spray and gently press the heavenly mixture into the pan. Don’t press it down too firmly. 6. Toss the remaining 1/4 cup mini chocolate chips into a small bowl and get that baby to the microwave. Heat it for 30 seconds, give it a stir and return it to the microwave for 30 more seconds. It should easily be melted after the second heating time. Stir until smooth. and drizzle the chocolate all over the bars. 8. Allow about 15 minutes for the chocolate to set up, cut into bars and enjoy! Oh my goodness. Oh my. Those look Yummy. I have a hard time beliving that and you can improve on the regular rice crispy treat, but I think youve just done it! Must. Make. These. Today. Your incredible photography and down-to-earth writing style make me always look forward to coming here. Thanks for the amazing recipes. You are a joy! Just made these. I didn't have peanut butter, but they still turned out amazing! Just made my first batch today to take to a Cub Scout bake sale “auction.” As soon as my kids and I sampled one in the kitchen, I immediately made a second batch so we could keep some for ourselves! These will definitely be made again! Amazing recipe as usual! Your blog has become my go-to for recipes I know I can trust. Your photos are perfect (and helpful) and your instructions make me crack up mid-recipe. 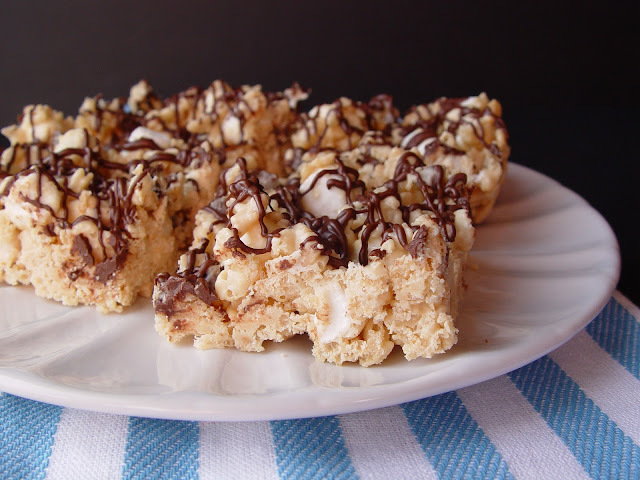 Made these last night for a 30th birthday party, and you would have thought everybody was in the fourth grade the way they got excited for “rice krispie treats on steroids”! Delish, but not overly sweet. Yet another winner! Thanks Jamie! It’s remarkable inn favor of me to have a site, which is beneficial designed ffor my know-how.